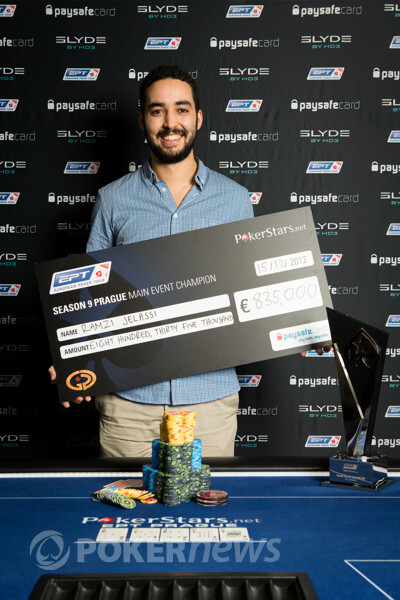 Ramzi Jelassi Wins the EPT Prague Main Event (€835,000)! The PokerStars.net European Poker Tour Prague Main Event was completed after a grueling 14-hour final table on Saturday. 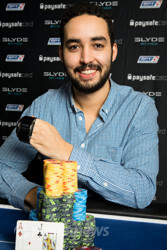 The winner, and the latest name to be written into the EPT’s history books, was Sweden’s Ramzi Jelassi, who picks up a life-changing €835,000 for his efforts — and of course a superb Slyde watch and the coveted EPT trophy. 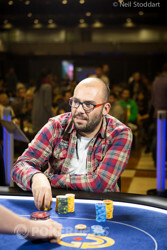 Going into the eight-handed final table, Jelassi was the chip leader with 5,675,000 chips — around one million more precious ceramic discs than his nearest rival Aleh Plauski. First to be eliminated was Mark Herm, as the talented American just never got going. On the 52nd hand of the final table, Sotirios Koutoupas saw the action fold around to him on the button, and he raised. Herm three-bet all in for 1,190,000, and Koutoupas called. Herm revealed the , and he found himself up against the of Koutoupas. The board ran out , and Herm’s tournament came to an end. An hour later on the first hand back from a scheduled break, Aleh Plauski lost his chips to Jelassi. It seemed like Plauski could not do anything right from the moment he sat down, and, although he started the day second in chips, he was the second player to be eliminated. In Plauski’s final hand, Jelassi opened to 160,000, Plauski three-bet to 350,000, and Jelassi four-bet to 540,000. Plauski decided his was good enough to move all in for 2,450,000 and Jelassi called with pocket nines. The final board read , busting Plauski and boosting Jelassi’s stack to just under 11,000,000. Following Plauski out of the door was Russian student Sergey Kuzminskiy, whose tournament ended at just before 17:00 CET. Dutchman David Boyaciyan raised to the table standard 180,000 and Kuzminskiy — who had three-bet all in at least three times during the past few orbits — moved all in once again, but this time he was called. Kuzminskiy flipped his cards onto their backs to reveal the , and he found himself in a coin flip against Boyaciyan’s pocket tens. By the river, the board read , and Kuzminskiy shook the hands of his former table mates before heading out of the tournament area. Five became four with the exit of the lion-suit-wearing Spaniard, Diego Gomez. That was not a mistype; Gomez really wore a lion suit at the final table. On Day 5, Gomez promised to wear some pajamas if he made it through to the final table, and he lived up to his promise by taking his seat whilst sporting a lion "onesey." The tournament became a less eccentric place when Gomez open-shoved for 1,840,000 in the small blind with what turned out to be the , and Boyaciyan snap-called with the . Although Gomez caught a nine on the flop, he could not find any more of his outs, as the turn and river were the and the , respectively. Four-handed play lasted close to two hours before British pro Ben Warrington finally ran out of luck. Warrington has been all in on a number of occasions and each time his bet either went uncalled or his hand held, but when Koutoupas opened to 210,000 under the gun, he then called when Warrington three-bet all in for 1,815,000. Warrington turned over the , and he was up against the of his Greek opponent. The flop was no help to Warrington, and the turn certainly wasn’t either, as it locked up the hand for Koutoupas. The river completed the hand, and Warrington headed to the sidelines. Three-handed play took longer than expected, partly because the players took 40 minutes to discuss a deal, and, when they could not agree in full, they were sent on a 60-minute dinner break to complete those discussions. When the players arrived back at the felt they still had not managed to agree and the decision was made to play out the tournament with the original payout structure. The deal stalled because Boyaciyan wanted a minimum of €440,000 despite being offered €415,000. At just before 23:00 CET, Koutoupas opened to 240,000 on the button, Boyaciyan three-bet to 560,000, and Jelassi cold four-bet to 1,225,000. Koutoupas folded and Boyaciyan made the call. The flop came down , and Boyaciyan moved all in. Jelassi called and turned over the . Boyaciyan revealed his cards — — and he was nicely in front. The turn gave Jelassi some extra outs to the diamond flush and the poker gods answered Jelassi’s prayers and gave him the on the river. With that, Boyaciyan became the third place finisher. Jelassi went into heads-up play with a 16,980,000 to 8,940,000 advantage — good for 66% of the chips in play — but it was far from a done deal. The one-on-one battle spanned over 100 hands, during which time Jelassi opened up several leads before Koutoupas closed them again. The last few hands started to go Jelassi’s way and his experience started to shine through. The final hand of the EPT Prague Main Event saw Jelassi open to 400,000 with the blinds at 100,000/200,000/20,000, Koutoupas three-bet to 1,000,000, and Jelassi move all in for the second time in two hands. The first time Jelassi did this, Koutoupas folded, but Koutoupas chose the to call off his stack this time. Jelassi flipped over the and the sizable rail surrounded the table as the dealer fanned out the flop. The turn was the and the river the . With that, Jelassi became the latest EPT champion! The next EPT stop is at the PokerStars Caribbean Adventure's 10th Anniversary in just a few short weeks. PokerNews will be there, and we hope to see you there. We thought we were going to be here until dawn and then all of a sudden it was all over and Sweden has another EPT champion to follow in the footsteps of such luminaries as Michael Tureniec and Anton Wigg. The final hand started with Jelassi opening to 400,000 and Sotirios Koutoupas three-betting to 1,000,000. Jelassi came back with shove and Koutoupas made a surprise call all in. The final EPT of 2012 ran . Congratulations to Koutoupas for a fine showing this week. Here's a selection of hands for you from the past 5-10 minutes. Hand 1: Sotirios Koutoupas opened to 400,000 then folded to Ramzi Jelassi's 1,100,000 three bet. Hand 2: The players checked down a board, Jelassi taking down the hand with a 400,000 river bet. Hand 3: Jelassi opened to 400,000, Koutoupas three-bet to 1,000,000 then quickly folded to Jelassi's 17,830,000 shove. Ramzi Jelassi has about the biggest lead he's had after a hand that went to showdown. Koutoupas opened to 400,000 and called when Jelassi three-bet to 1,075,000. The flop was dealt as and Jelassi opted to check-call a 925,000 bet. No more chips ventured into no man's land as they checked down the turn and river. Koutoupas' missed and Jelassi took the pot with . Dan Smith takes €68,120 after winning the €5,000 Turbo in Prague to top an incredible year. Read more at the PokerStars Blog. The first few hands since the break have seen a number of smaller pots develop, mainly because the player seem content to check down most board. One hand that reached showdown saw Jelassi open to 400,000 and Sotirios Koutoupas call. The flopsw the action go check-check, but Koutoupas lead out for 325,000 upon the arrival of the turn. Jelassi called and the dealer got busy putting the into view. Now Koutoupas checked, then folded when Jelassi set the price to play at 825,000. Warrington Doubles Up By Cracking Kings!